Frank Scoblete is America's #1 best-selling gaming author, casino games expert and speaker. He has been awarded certificates from Amazon.com as the best-selling gaming author on the Internet and the Barnes & Noble website calls him: "Unquestionably the number one best-selling gaming author." His books and television shows have been written about and reviewed by many of the nation�s top newspapers and magazines. Frank is now published by Triumph Books, a division of Random House, the largest publisher in the world. See television media presentation and excerpts from shows: http://video.google.com/videoplay?docid=-4638870588901763565#. Frank Scoblete grew up in Bay Ridge, Brooklyn, New York. He attended St. John's Prep on a full athletic scholarship for baseball and basketball. Switching directions, Frank attended college on a full, academic scholarship. In college, Frank boxed ("I was pummeled in my last fight. I have no memory of the last seven minutes.") and wrote for the school paper. He majored in history, literature and philosophy. Frank has three masters� degrees. From 1969, the year he graduated college, until 1974, Frank worked as a feature writer, then editor, then managing editor, and finally publisher of Island Magazine, a news magazine on Long Island. He was the first writer in America to investigate the phenomena of teenagers hanging out in shopping malls, an investigative piece that gained him national attention. During this time, Frank was also a frequent free-lance reviewer of books, nightclubs and gourmet restaurants for a number of New York newspapers and was a frequent guest on radio and television shows. He also had his own radio program "Frank Scoblete Live!" In 1975, Frank decided to try his hand at acting ("I've always been a ham!"). In 1979, Frank co-founded The Other Vic Theatre Company, a professional touring troupe that played dinner theatres, resorts, and charities. From 1979 until he sold his share of the company in 1989, Frank produced, directed and acted in over 50 plays. In 1986, Frank was researching the lead role for the hit play, The Only Game in Town - the story of a down-and-out gambler in Las Vegas. His co-star was Alene Paone. They went to Atlantic City to research their roles. "I was hooked. I began to realize that I enjoyed the casinos even more than I enjoyed working in the theatre." Alene and Frank toured in the play for four months, fell in love, and married. In 1989, Frank sold his share of the theatre company and began his career as a gaming writer with articles and short stories for Win Magazine. He had spent four years (1986 to 1990) researching, analyzing, and when he could, playing the games. From 1990 to 1992, Frank "basically lived in the casinos." With the phenomenal success of his first book, Beat the Craps Out of the Casinos in 1991 (which has subsequently become the best-selling craps book of all time), Frank began a successful climb to the top of the gaming mountain. He is now the most well known, respected and sought-after gaming writer and speaker in the country. Frank has also served as a consultant to IGT, J.Berwin and eGaming Review in England, CNN, the Discovery Channel, ABC, Walter Cronkite, TBS, Silicon Gaming, Mikohn Gaming, Cadallac Jack and The Travel Channel. He has appeared frequently on television including the History Channel, A&E, the Travel Channel, CNN, TBS, and the National Geographic Channel, among others. Frank has done hundreds of radio shows throughout the country and his "gaming tips" are broadcast on KATY in California. Frank has written several television shows for the Travel Channel, A&E, and the History Channel. Frank has several very popular websites: www.scoblete.com in association with CasinoCity.com; also www.goldentouchcraps.com and www.goldentouchblackjack.com. He has a private members-only website as well. A charismatic speaker, Frank has been featured at many festivals and symposiums, most recently Sunset Station's Beat the House Seminar in Las Vegas; The Craps Festival at Sam's Town in Tunica, The Las Vegas Craps Festival, Casino Player's Atlantic City Gaming Festivals at Trump Taj Mahal and The Tropicana; The Casino Player Las Vegas Gaming Festival at The Tropicana; The Midwest Gaming Expo in Chicago; The Harvey Illinois Gaming Festival; The Texas Gamblers Expo in Austin, A Weekend with Frank Scoblete at the Golden Nugget in Las Vegas and A Weekend with Frank Scoblete at Sam's Town in Tunica. He has also done Frank Scoblete's Gamblers Jamborees at Sam's Town, Isleta Casino, Gold Strike and Windsor Casino Hotel. He has given talks at bookstores throughout the country, and also at libraries, charitable organizations, at fund-raising activities and at the Learning Annex. Frank does about 15 private seminars a year in craps, blackjack, slots and poker with his Golden Touch™ company of experts. Frank calls his public talks "instructional entertainment" and they are characterized by a lively stage style, good information, and humor. "As an actor I always enjoyed performing before a large audience but often found myself performing for less than sold-out shows. As a gaming speaker, it's standing-room-only for most of my talks." Because of the tremendous popularity of Frank's talks, Paone Press came out with a series of audio cassettes in 1997 featuring him discussing various aspects of casino gaming: Slot Conquest, and Power of Positive Playing. His recent DVD (2008) is Golden Touch™: Beat Craps by Controlling the Dice which shows over 200 unedited controlled dice throws. Frank is a strong advocate of casino gambling "for fun and hopefully profit" and he has debated anti-gaming advocates in the past. "While I am a casino gaming advocate in general, I am a player advocate in particular. I want to see players get the best run for their money and I love to see players win! All my books and tapes are geared to giving players the best possible shot at beating the casinos." 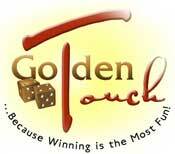 In that spirit Frank formed the Golden Touch™ Craps™ dice control seminars in 2002 with Dominator, Mr. Finesse and author Bill Burton and the Golden Touch™ Blackjack seminars in 2004 with Dominator, Henry Tamburin and Dan Pronovost which teaches the revolutionary new Speed Count. In 2007, Frank launched his Casino Killer College which will teach advantage methods for slots, video poker, poker and Pai Gow poker. Frank is a regular contributor and columnist for over 50 magazines and newspapers in America, Canada, and the Islands. He is widely syndicated on the internet. Frank Scoblete lives in New York with his wife, Alene Paone Scoblete. He has two grown sons. All his books and tapes are available in leading bookstores such as Barnes & Noble, B. Dalton, Borders Books & Music, Walden Books or on Internet book sites such as Amazon.com. or by calling 1-886-738-3423. To book Frank as a consultant, speaker or for special engagements, or if you are interested in having Frank write for your newspaper or magazine, please write to Frank at fscobe@optonline.net or call him at 516-596-3239. Get the Edge at Roulette: How to Predict Where the Ball Will Land! by Christopher Pawlicki. Frank was the co-owner of The Other Vic Theatre Company for 12 years. He produced, directed and acted in over 50 plays. Frank has done over 200 guest spots on radio shows across the country. Frank's gives advantage-play classes, Golden Touch™ Craps™, Golden Touch™ Blackjack, and his Casino Killer college which teaches advantage play on advantage-slot machines, video poker, casino poker, Internet poker, tournament poker and Pai Gow poker. Frank Scoblete can be reached by calling 1-516-596-3239 or by writing to him at: PO Box 446, Malverne, NY 11565. His email is fscobe@optonline.net.